Feelings: I have been trying to dine in at Hummus Kitchen for a while now, but its limited seating is always filled to capacity during my lunch hour. On this rainy afternoon, we were able to finally have a relaxing lunch with delicious hummus. Our friendly and adorable waiter was extremely accommodating, and I could see why it is always packed here. The nice lounge atmosphere just makes you want to hang out at the place. 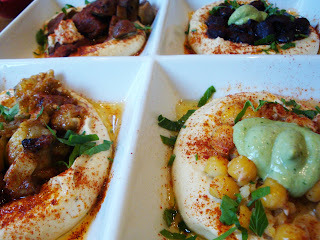 We tried Mixed Platter, where you can choose three mazze (appetizer) for $8.95. AP and I ordered bureka (stuffed puff pastry with feta cheese, eggplant and dry tomato), falafel and hummus along the side of whole wheat pita. 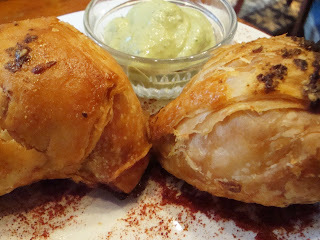 The Bureka was flaky and stuffed with feta cheese. It was a little bit too greasy for me, and I was left desiring more flavor. 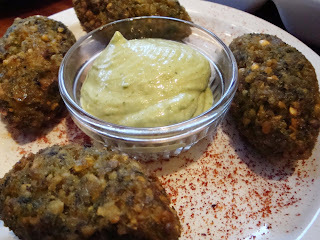 The falafel had a crispy outside with a smooth and delicious inside, and the hummus had a good consistency of creaminess. Both went perfectly well with the warm and fluffy whole wheat pita. I also enjoyed the hummus platter we shared. It came with four different types of hummus, and I especially enjoyed the mushroom hummus, which was the most flavorful of all. My favorite hummus spots are still Hummus Place and Taim, but Hummus Kitchen is a solid choice for vegetarian/vegan lunch. Their wonderful service, affordability and cleanliness make this place my midtown choice for hummus and falafel. i came here when they first opened. I'm glad business has picked up. I agree with the hummus. Think HP (not Taim) has the best. 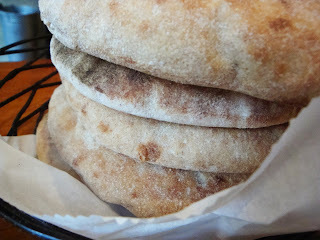 Wish the pitas were homemade though. But I'm being picky. :) there's another sister restaurant on the UES. I do like Hummus Kitchen, but I find the staff to be very pushy. They are constantly trying to upsell items which really annoys me. The Hummus and Falafel are tasty though and it's a good lunch option. But for better falafel I prefer Azuri Cafe on 51st between 9th and 10th. I like the pita better there as well. I tried Taim and was none too thrilled with the food. The grease was too much for me. But I am looking forward to trying Hummus Place, even though their newest location on St. Marks replaced Sympathy for the Kettle. when are we going to azuri! ?